The lymphatic system encompasses a network of vessels, glands, and organs located throughout the body. Functioning as part of the immune system, it also transports fluids, fats, proteins, and other substances in the body. Lymph nodes, or glands, filter the lymph fluid. Foreign bodies such as bacteria and viruses are processed in the lymph nodes to generate an immune response to fight infection. Trypanosomal chancre on shoulder with lymphangitis toward axilla. For patient education information, see Swollen Lymph Nodes. In individuals with normal host defenses, species of group A beta-hemolytic streptococci (GABHS) are the most common causes of lymphangitis. These organisms elaborate fibrinolysins and hyaluronidase, which aid their invasion of lymphatic channels. Lymphangitis caused by GABHS can rapidly progress and has been associated with serious complications. Staphylococcus aureus can also cause lymphangitis, although the disorder is more likely to occur in patients with cellulitis due to GABHS than in those with cellulitis resulting from S aureus. In addition, individuals with diabetes, immunodeficiency, varicella, chronic steroid use, or other systemic illnesses have increased risk of developing serious or rapidly spreading lymphangitis. The prognosis for patients with uncomplicated lymphangitis is good. Antimicrobial regimens are effective in more than 90% of cases. 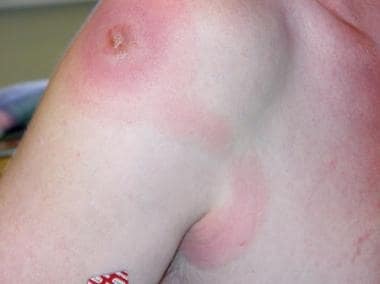 Without appropriate antimicrobial therapy, however, cellulitis may develop or extend along the channels; necrosis and ulceration may occur. Lymphangitis may spread within hours. The morbidity and mortality associated with the disease is related to the underlying infection. Although no specific data are available regarding complications and mortality associated with lymphangitis alone, lymphangitis caused by GABHS can lead to bacteremia, sepsis, and death. Akogun OB, Akogun MK, Apake E, Kale OO. Rapid community identification, pain and distress associated with lymphoedema and adenolymphangitis due to lymphatic filariasis in resource-limited communities of North-eastern Nigeria. Acta Trop. 2011 Sep. 120 Suppl 1:S62-8. [Medline]. Akogun OB, Badaki JA. Management of adenolymphangitis and lymphoedema due to lymphatic filariasis in resource-limited North-eastern Nigeria. Acta Trop. 2011 Sep. 120 Suppl 1:S69-75. [Medline]. Cohen BE, Nagler AR, Keltz Pomeranz M. Nonbacterial causes of lymphangitis with streaking. JABFM. 2016 Nov-Dec. 29(6):808-12. [Full Text]. Abraham S, Tschanz C, Krischer J, Saurat JH. Lymphangitis due to insect sting. Dermatology. 2007. 215(3):260-1. [Medline]. Marque M, Girard C, Guillot B, Bessis D. Superficial lymphangitis after arthropod bite: a distinctive but underrecognized entity?. Dermatology. 2008. 217(3):262-7. [Medline]. Simma L, Barrett MJ. Ascending upper limb lymphangitis. BMJ Case Rep. 2017 Sep 28. 2017:2741. [Medline]. Tomas X, Pedrosa M, Soriano A, Zboromyrska Y, Tudo G, Garcia S, et al. Rare diagnosis of nodular lymphangitis caused by Mycobacterium marinum: MDCT imaging findings. Acta Radiol Short Rep. 2014 Feb. 3 (2):2047981614523172. [Medline]. Hirschmann JV. Antimicrobial therapy for skin infections. Cutis. 2007 Jun. 79(6 Suppl):26-36. [Medline]. [Guideline] Calfee DP, Salgado CD, Classen D, Arias KM, Podgorny K, Anderson DJ, et al. Strategies to prevent transmission of methicillin-resistant Staphylococcus aureus in acute care hospitals. Infect Control Hosp Epidemiol. 2008 Oct. 29 Suppl 1:S62-80. [Medline].